For more than a decade, there has been one time-tested way to end partisanship and get Washington Republicans and Democrats working together on the most pressing national issues: throw a retirement party. It's no joke. The pattern is long established. Party leaders who lead the charge while in office  pushing for party-line votes and vocally criticizing the opposition  often become symbols of postpartisan cooperation and productivity once they leave office. The one place, it seems, where Democrats and Republicans can still get along is in retirement. "We are all less inhibited when we are not there, when we are not elected," says Republican Pete Domenici, who retired last year after a 36-year career as a New Mexico Senator that included several important bipartisan accomplishments. He is now leading a U.S. debt-reduction task force with Alice Rivlin, a Democrat who directed the Office of Management and Budget for President Clinton. 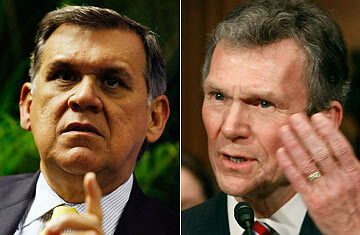 Former Democratic Senate majority leader Tom Daschle spent years in the Senate taking the point against Republican legislation, but after leaving office, he joined the advisory board of the Bipartisan Policy Center, where he partnered with a storied GOP flag carrier, Bob Dole. He also now works at the lobbying firm DLA Piper with former Republican Senator Mel Martinez, who was co-chairman of the Republican Party less than three years ago. A few blocks away, former Republican Senate leader Trent Lott has set up a lobbying shop with former Senator John Breaux, a Louisiana Democrat. Florida Democrat Bob Graham left Congress in 2005 and joined with retired Republican Senator Jim Talent of Missouri to work on a national commission on the proliferation of weapons of mass destruction. On Thursday, Feb. 18, President Obama announced that former Republican Senator Alan Simpson would join with former White House Chief of Staff Erskine Bowles, a Democrat, to lead a commission on tackling the deficit. Simpson greeted the news by decrying the state of American politics. "To use politics of fear and division and hate on each other  we are at a point right now where it doesn't make a damn whether you're a Democrat or a Republican if you've forgotten you're an American," he said. So why do former members of Congress find it so much easier to get along across the aisle after they retire? Interviews with a number of them suggested answers that are sometimes surprising and trends that are daunting. It's not just the obvious political pressures of messaging for re-election, they said, but also the pressures of fundraising and time. Former Democratic Representative Dan Glickman, who left Congress in 1995 and went on to lead the Motion Picture Association of America, pointed to the growing pressure of fundraising as a prime factor. Not only must politicians spend more time raising money, but also the need to raise money often distorts the incentives for bipartisanship. "There are not a lot of incentives in the system to solve problems," says Glickman, who noted that segmentation of the media plays a role. "Solving problems is seen as being a kind of weakness, because it means that you have compromised." At the same time, problems left unsolved can be fundraising boons, since wealthy interests are forced to keep working the Hill if issues are left unresolved, pouring more and more money into campaign coffers. "In many cases, the incentives are to keep problems lingering, because if you keep problems lingering, there is the opportunity to do more fundraising," says Glickman. Another pressure that is eliminated in retirement is the scant amount of time members of Congress now have to get to know one another in the rival party. "There appears to be kind of an ever growing diminishing of relationships across the aisle  of fellowship and friendship," explains Domenici. "As soon as the votes are over, people are gone. You can't find them." More and more often, members choose not to move their families to the Washington area, which results in them spending less and less time in town. At the same time, new ethics rules have reduced the frequency of sponsored overseas travel, depriving members of that chance to spend time together. "It's on the 13-hour flight to Armenia that you get to know each other," says Jason Grumet, president of the Bipartisan Policy Center. Ironically, it is only in retirement that these pressures of fundraising and limited time in Washington tend to fall away, finally giving public servants new opportunities to actually do the work they wanted to do when they sought election in the first place. Domenici says he finds it funny that people refer to the U.S. Senate as a "most exclusive club." "It's a strange club," he jokes, "if people don't get together." See the top 10 editorial cartoons of 2009.